Gojushiho Sho kata performed by Miriam Szkudlarek from France. This kata was performed in 2nd match for 3rd place in WKF tournaments (Finland) in 2006. She won the 3rd place. 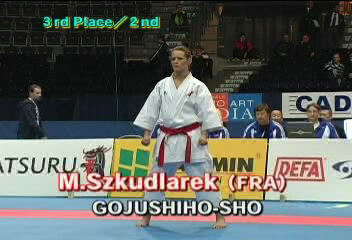 Gojushiho Sho| Performer: Miriam Szkudlarek | Source: karate-do.co.jp | Duration: 00:02:29 | Format: mpg | Video Size: 24,8 MB | Player: Windows Media Player or Media Player Classic.